Thanks for hosting Top Ten Tuesday these many years, ladies. It's been an amazing meme to hang out with and meet new bloggers. ... and thank you, Jana, for taking on this meme so we can continue to enjoy it and chat with each other each week. Once you start Harry Potter, it's generally hard to stop! 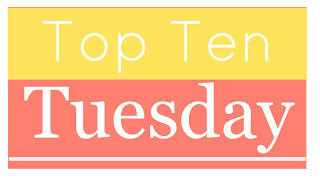 At first I was bummed that you guys wouldn't be hosting Top Ten Tuesday anymore (especially since this is the first time I've actually linked up! ), but I'm glad it will continue on in another place. I have a couple of Megan Miranda books on my "To Read" list. I've read/heard mixed reviews about them, but I'll still check them out at some point. I hope you all find time for the books you want to read this year! 84 Charing Cross Road is highly enjoyable, as is the movie based on it. I recommend both! Thanks for such a fun run! Definitely down with that last one! Lol! I haven't read most of these, but La Belle Sauvage was the last book I read in 2017, and I highly recommend it! I had my doubts, but it was at least almost as good as His Dark Materials! Your #10 is so much truth! Hope things are okay for you to not be able to host anymore. Hopefully we still get to see you around the blogosphere! Thanks so much for hosting this every week, it's been so much fun! I failed at reading a lot of these, too. I especially need to get to The Underground Railroad and Little Fires Everywhere. I hope you guys get a chance to read all these! Thank you so much for hosting over the years! This is one of our favorite memes, and it's always so much fun, and we look forward to following Jana's blog! I started re-reading the HP series this year and only got to the first two books although I was hoping to finish all of them in 2017. I guess we can keep working on it in 2018! Thank you for hosting TTT for so many years. It's been fun to join in, sometimes weekly, sometimes just occasionally. Best of luck to you all, and thanks to Jana for agreeing to host going forward. I'm re-listening to the HP books for the umpteenth time. And 84 Charing Cross Road is on my list to read someday, but I doubt it will be this year. We'll see. I'm behind on a lot of ARCs, and need to catch up on them first. So glad to be able to participate with you on the last TTT you guys host. Wish you all the best in the future, and hope to hear from you all from time to time.